The season opener for SFR brevets this year began with a beautiful and dramatic corkscrew dive by a pelican (white or brown, I couldn’t tell) about 40 feet above the water surface at the waterfront in Sausalito as I passed through early in the morning along with 92 other intrepid randos on January 30, 2016. Whew, that was breathtaking! The Brevet Wildlife Report for this ride is filled with two-, four-, and zero-legged creatures, some seen, some only heard, but the first one (the pelican) was the best! I think it bodes well for this year, let’s hope anyway! I must admit I was not totally sold on this route based on my experiences last year. Losing the Light House route was traumatic, and adding more mileage to the out-and-back on highway one was not appealing. The traffic on the highway was busy last year to say the least. But I am pretty loyal to my home rando club, the season opener cannot be denied or shied away from, and heck I might as well since it’s time to start another R-12 if I wanna be like Willy N.
Another de-motivating factor popped up the week before the ride: I got a mysterious and painful earache, making me wonder whether doing this ride is quite sensible. But I made my preparations either out of habit or who knows why; you just have to get out there and try your best. I often think about PBP stories I have read in which the rider is 2 days away from the ride they’ve been dreaming of and planning for in some cases for years… and the rider has something go wrong with their bike, or some random slip and fall happens, or a bad case of jet lag leads to catching the flu or something. Although I obviously don’t have as much invested in the garden variety SFR brevet, I do cherish each ride, since you never know when you truly cannot go out there. And I was well rewarded for my attempts to get out there! 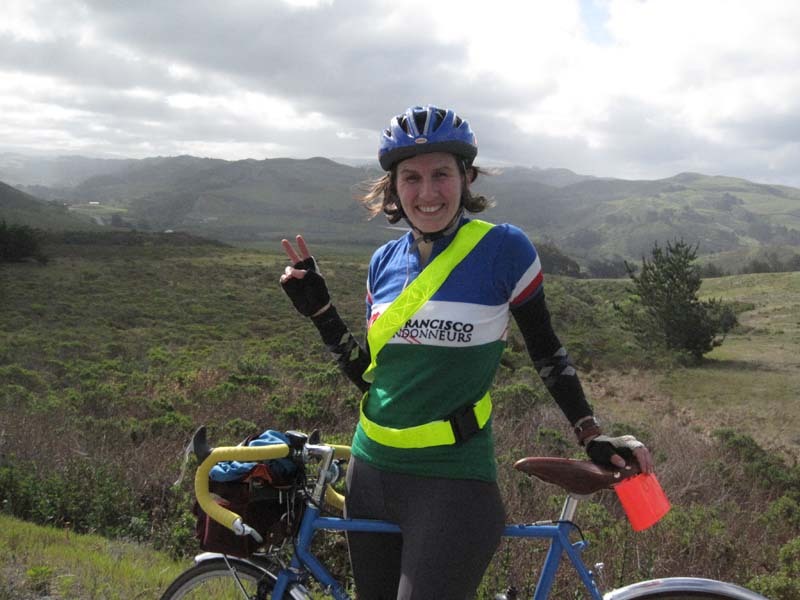 The day was gorgeous, the beauty of Point Reyes National Seashore was ravishing, I got to spend a good amount of time riding with friends but also some peaceful time on my own, and because of the two out-and-back legs of the route, I got to wave at all the riders passing by. Just perfect for a season opener! The route is definitely growing on me. Though I still miss going to the Light House, this route has far fewer cattle grates, an advantage which can’t be denied. My earache pretty much disappeared, confirming my belief that randonneuring is the cause and the cure of all my physical challenges. As for the wildlife of note, I got to see the Tule Elk this year! One perk of the Pierce Point route is that it passes through the Tule Elk refuge. Just scanning over the Wikipedia page for Tule Elk, I felt fortunate to see the healthy populations of this species once thought to be extinct. Another wildlife sighting was less exhilerating but still unusual: a big, fat banana slug in the middle of the shoulder on White’s Hill outbound. I was just amazed that no one had run it over! Haven’t seen one of those in a while, but I guess because of the increase in wet weather, probably something I’ll see more of. Another great wildlife non-sighting was hearing frogs throughout Inverness. They were singing their little guts out! And finally, in addition to the diving pelican on the waterfront in Sausalito, I saw a seal in the water there as well as a lovely Western Grebe, a bird of the loon family native to my birthplace in Wisconsin. And finally, for some pictures! 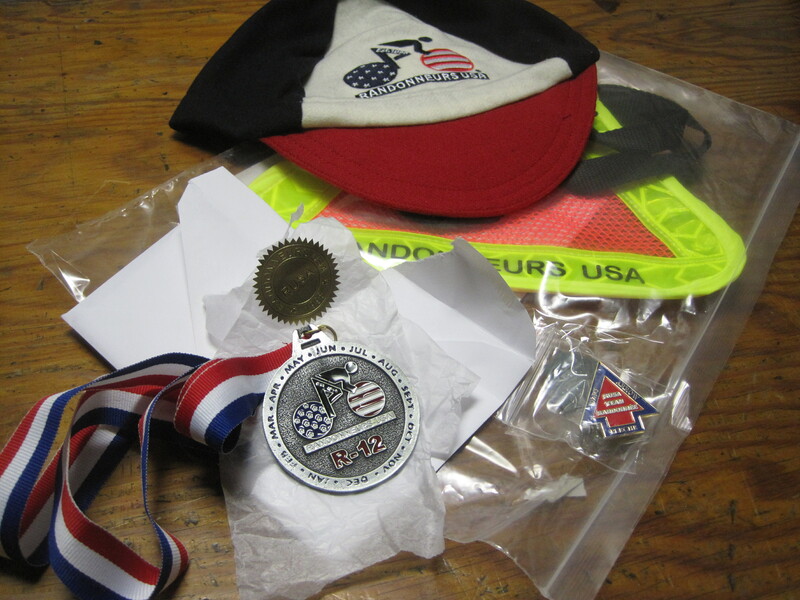 To the victor go the spoils… wool cap with RUSA logo, RUSA-branded reflecto triangle, dart lapel pin… and R-12 medal! yay, I really did it! Of course, little did either of us know how close to the limit we would be pushing our luck! Riding with Tom, Keith, and Steve was the one bright spot I was looking forward to about this ride, and was relieved and heartened by Tom’s response. And despite all the self-effacing comments made in jest by each of them about me wishing I had ridden by myself, I was so glad for their company! They were funny, teasing each other throughout the day. I could easily tell the three anciens had ridden many, many miles together. To get an idea, look at Tom’s pictures on flickr from the ride. Hilarious! Another great thing about riding with them was that over the course of the day, we all traded pulls in a sense. We didn’t ride in a paceline, but in the early part of the day, Steve and Tom rode up front… Steve was way up front! This is usually my weakest part of the day. I took my turn at the front after the Ugly Mug, on the climb up Soquel-San Jose Road. In the final stretch through Cupertino, Los Gatos, and Mountain View, Keith blasted ahead of us, really pulling us all toward the finish through his childhood home turf. The three fellas had only done this route once, a bit eccentrically as an overnight ride Tom had crafted as a commute to his job in Mountain View (attesting to his fitness level, he said when he showed up for work, none of his coworkers could tell he had just ridden his bike on a 200-kilometer overnight “commute”!). For me this would be my fourth time on this course. The first half or so of this ride was pretty rote, although there were a few tactical errors we made early on from which it was difficult to recover. One was that we did not leave Peet’s until about seven o’clock, almost a full half hour after our scheduled start time. 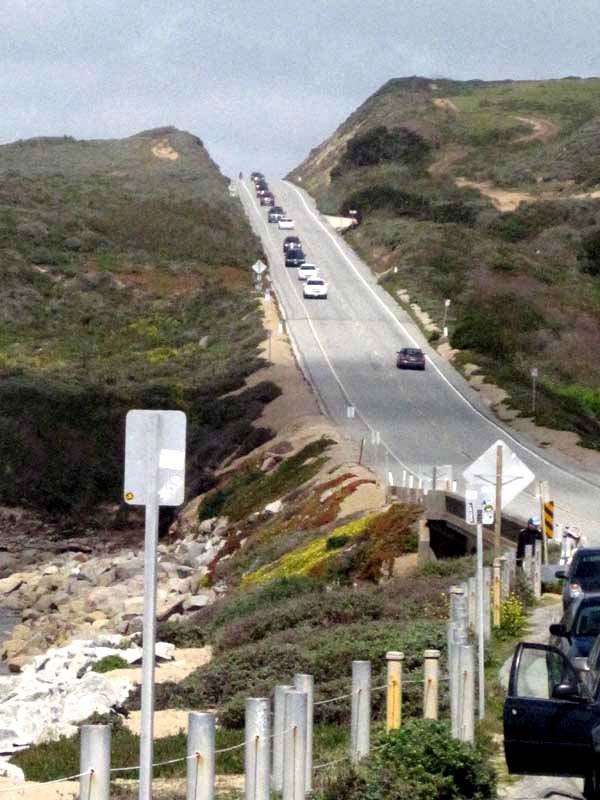 The other was my fault: I had grown accustomed to taking the oceanside path along Sharp Park beach instead of taking the road past the golf course clubhouse, and I really like this way. The guys seemed into taking the path, as they weren’t familiar with going that way, but I think it added several minutes to our time. 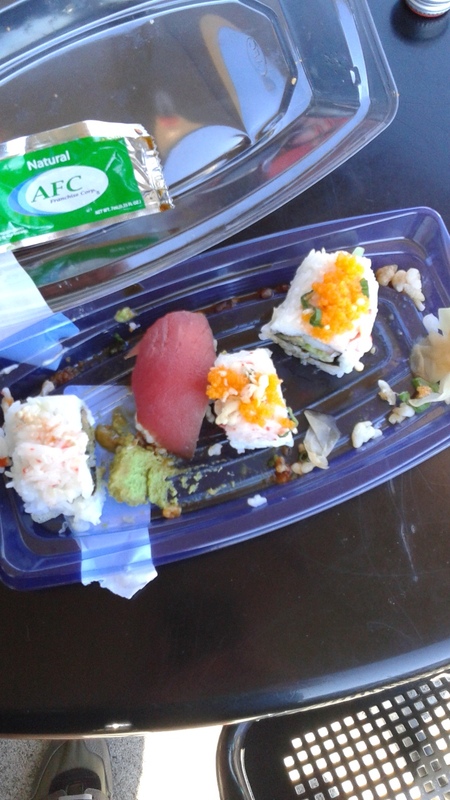 In any case, somehow we only made it to Arcangeli’s with 45 minutes to spare. I’m also accustomed to hanging out for a while in the lovely creekside back yard they have there, so when Tom announced it was time to hit the road shortly after Keith and I sat down to eat our half sandwiches, it was shocking! But he was right, there was no time to lose– not a pleasant feeling so early on in a ride. It did not start raining until we were about midway through Santa Cruz, but we were all soaked and feeling frigid by the time we got to the Ugly Mug, with only half an hour to spare at that control. 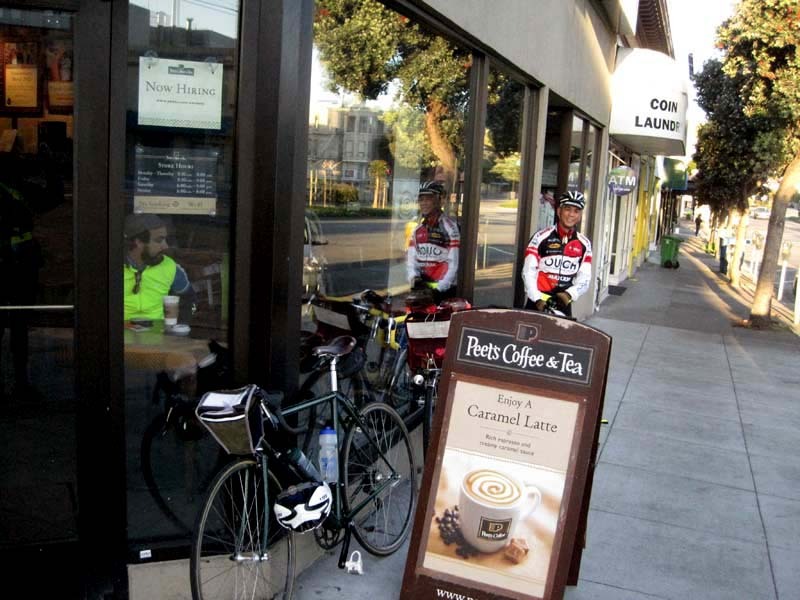 As we rode through Santa Cruz, the guys all asked me questions about the little cafe. I forgot they had used an all-night Safeway as their Soquel control, and had stopped at a diner in Santa Cruz for late-night sustenance. I didn’t want to give anyone high hopes about the Ugly Mug since they usually just had one or two things they could heat up (Birthday chicken pot pie aside), and it being almost three o’clock on a rainy day I figured they’d probably be out of them. Some of my favorite moments in randonneuring have occurred at the Ugly Mug, but today I just wasn’t up to the mellow vibes. I ended up buying a green juice to get my receipt (which, although their register was never on time, now that they’d switched to using a scientifically calibrated, precisely accurate iPad as cash register, they could no longer print receipts at all and had to email my receipt to me! whither the future of randonneuring without cash registers?? ), and hung out in the back hallway of an adjacent office building (it was warm!) where we parked our bikes, eating the remainder of my sandwich from Arcangeli’s and trying to figure out how on Earth we were going to finish this ride within the time limit. Rain + climbing + wet, dark descent + stoplights, stoplights, stoplights through Cupertino etc. = DNF any way I looked at it. All I could do was try to eat as much as possible to give myself some energy to put a smile on my rained-on face and keep plugging away. 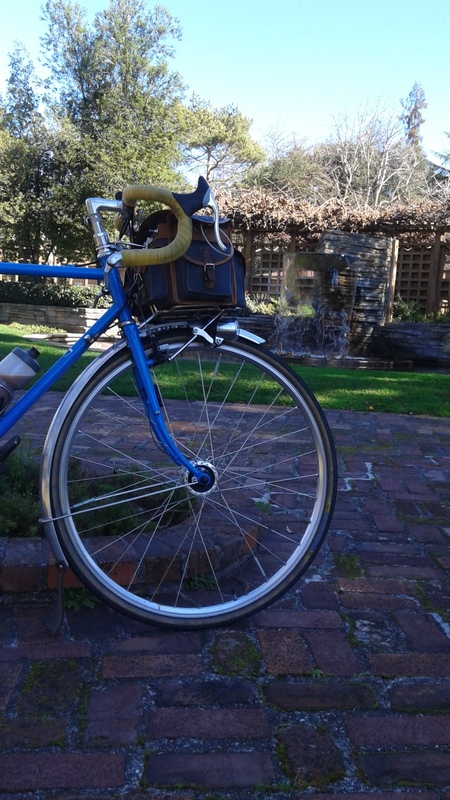 When we got back on the road, I was very much cheered by the climb up Soquel-San Jose Road. I felt warmed by the body heat generated by physical activity, and I very much enjoyed the opportunity to chat with Tom about radio stations in San Francisco and other rides we’ve done or would like to do. By the time we reached the top, it was quite dark, wet, and chilly. I went ahead to the Summit Store to see if I could find some shelter or warmth while waiting for the fellas to regroup. As the rain steadily fell, my Pelican and I got a whole range of puzzled, sympathetic, and even some terrified, looks as I stood in the vestibule of the store next to the cords of firewood. Diametrically opposed to the advantages of climbing in the cold and wet stand the disadvantages of descending in the cold and wet: you are not pedaling, so no body heat is generated; and you also move 6-7 times as fast, so the cold air affects you that much more. Luckily, Keith reminded me to put on my extra sweater before we left the Summit Store, the one I had brought in order to have a warm, dry layer to put on for the Caltrain ride home. Eesh. Another difficulty of descending in the rain and cold in this particular route was that the road has lots of switchbacks, yet no streetlights in many stretches– it is utterly rural, in the middle of a thick, dark forest. And as we left the Summit Store, I heard that Steve’s headlight had been shorting out! Luckily it seemed to start working again just as we got back on the road. The last time the three of them had done this ride, they descended Old San Jose Road and Aldercroft Heights Road in the dead of night. What an amazing challenge and incredible experience to make this beautiful descent in the still of the night. Andrea Symons said that stretch of road “brings an tear to one’s eye,” and I agree. Tom said the group would do that ride again next year as an overnight, and I hope I can go along! Hopefully next time it will be less chilly, wet, and harrowing for me. I did ok by staying focused on Tom’s and Steve’s head and tail lights as they cornered up ahead of me to give me an idea of where the road would bend. Fortunately the wet pavement was not as much of a concern as I would have thought. The night before the ride, I had installed a fresh set of rear brake pads, knowing they seem to wear down faster in the rain. Long, wet, dark, scary, white knuckle descent handily accomplished (at least, that’s how I felt once it was over! ), all of us knowing we had very little time in reserve if any, we entered the short trail section to Los Gatos. We all got down the steep, rocky part, started to gain momentum over the smooth, pleasant, fine gravel surfaced trail that parallels the river, and… Keith called out to let us know he had a flat tire. Now when I look back on it, I can only laugh, but at the time we did not see the comedy in the situation, least of all poor Keith, who had already suffered one flat tire that day. We had about 15 miles to go, and 40 minutes remaining on the clock. Tom suggested we could split up, with Steve and I going on ahead to make sure I would get credit for the ride. Though I appreciated the offer, I didn’t feel good about doing that– I didn’t like the idea of breaking up the group, I felt that we should be able to replace a tube in a few minutes anyway, and I also knew that Keith was doing installment eleven of his own R-12. So, we all set to work. Steve and Tom had headlamps mounted on their helmets, so they helped Keith find his tools and tube. Keith had some trouble getting his tire off the wet rim, so with my ever-unfailing fine motor skills from years of benchwork, I was able to get his tire off. Once Keith got the new tube in, Steve helped him use a CO2 canister to fill it (much faster!). We reassembled ourselves within minutes, and set out again with new resolve. There are two sections of this route I don’t like: riding through Santa Cruz to Soquel, and riding through Los Gatos, Cupertino, and Mountain View. They both happen to be urban or suburban streets with lots of stop signs, stoplights, and turning lanes of car traffic that awkwardly merge with bike lanes, and they both also precede controls (i.e., stretches where I’m bound to be hungry and possibly slightly just a little bit cranky). I don’t know why every time I do this ride I expect these sections to get shorter, but having done this route a few times now, they stunningly have stayed the same distance. “Okay then,” I said to myself as we entered the heavily trafficked shopping district of Los Gatos, “This is just going to take as long as it takes.” I reached for one of the honey stinger energy goo things my dentist told me to avoid, just to be sure I wouldn’t end up snapping at one of my new-found friends out of a lack of carbs. Steve and I eye our watches, then our odometers. Our odometers, then watches. Steve does some brief mental calculations, and looks at me reassuringly. “We’ll make it,” he says. I try with wet gloves to flip over my cue sheet, but I lose the wrestling match and just get ink and shreds of soggy paper dragged over the sheet. So much for fine motor skills… All the while, Steve, Tom and I are racing to catch up with Keith, who had a three-alarm fire under his saddle all of a sudden! Which was awesome, because we ended up getting to the 7-Eleven with only five minutes to spare. Five minutes! Think of all the things that take only five minutes. Microwave popcorn? Cup o’ Noodles? Third Uncle? That length of time made the difference between getting credit or not for this ride. What a suspenseful and dramatic finish to my R-12! Thanks Tom, Keith, and Steve for another heroic, epic, comical, entertaining, and challenging day on the bike. As promised, I bought a bottle of 7-Eleven’s best champagne for us all to drink on the train ride home. Tom had brought cups, so we wouldn’t even have to drink it out of our water bottles! I even offered some to a crazy person on the train who said he had been a bike messenger in New York. 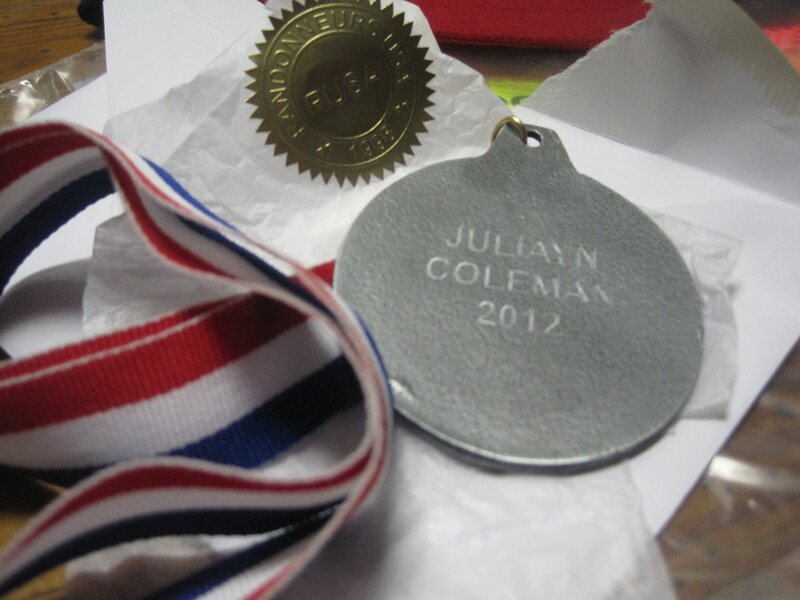 Steve presented to me a Real R-12 Medal (in fact belonging to, and borrowed from, Jason Pierce), which was kind of touching, if anything involving Jason Pierce can be described as “touching” without seeming really icky… ahem. As I have mentioned earlier, it was kind of his fault I got wrapped up in this R-12 business anyway, so it seems fitting he was somehow insinuated at the end. And now, we have come to the end of our tale entitled mmmmbike: appetizing rides carried out while pursuing the RUSA R-12 award. There will be more tales, to be sure, and possibly an entry recording what I think I learned. I’m not sure yet what form my future ride reports will take, since my only goal for the new year is to ride a 400k. Perhaps the blog needs a new subtitle. Writing blog entries about my rides has helped me review what I’ve learned throughout the year, so I definitely want to keep writing. Reading others’ ride reports is endlessly fascinating to me as well, so I want to continue to contribute to the form. As for riding, ideally I would like to give the Pelican the month of January off, but the Lighthouse brevet beckons. In the meantime, to keep from getting restless, I’ve been enjoying indoor activities such as lap swimming and yoga. I used to love lap swimming in Chicago in the winter months, especially in the mornings when the sun would hit the beautiful indoor pool at the park district near where I lived. Lately I’ve also enjoyed a couple short social rides, and another bike camp to rejuvenate my excitement for riding. Other than that, who knows what the future holds for me and my Pelican? To find out you will just have to stay tuned for the next exciting installment of mmmmbike! What more can be said about this ride, really? Just having done this ride one time, at the end of the day I was at a complete loss for words. 7500 feet of elevation gain is not that much compared to most of the permanent routes I’ve ridden this year, so it doesn’t seem like it should be that much of a challenge. When I think about the day of this ride and all twelve and a half hours I was on or off the bike throughout the day, it surely was epic, a day with many chapters. Not quite like a Tolstoy novel, but you get the idea. For me, this ride actually started back in October of 2011. I volunteered for the SF Randonneurs at the Winters lunch control making sandwiches. I had just put down a deposit on a Pelican, so when Bryan C and Theresa L arrived at the control both riding Pelicans, I asked them about their bikes and whatnot. Bryan asked me if I was thinking about doing the Lighthouse brevet. I said sure, not having a clue what I was getting myself into. When I got home and realized what I was getting myself into, I snapped into action. I knew I was really going to do it, I just had to figure out how. The longest ride I had ever done at that point was under 20 miles, and the brevet was less than four months away. I asked a friend to help me come up with some way to train up for this ride, and he listed off all the major bike routes in Marin: start with a Headlands loop, then Paradise/ Tiburon, then go to Fairfax and San Anselmo, then Nicasio Reservoir. Then go to Point Reyes Station. Every week I kept going farther. By new year’s I was up to 100-mile rides. My friend also gave me a book: Sports Nutrition for Endurance Athletes. I have always had a stunningly huge appetite, so learning that eating more would be helpful was great! While training, I discovered I really loved my time on the bike. I could feel my lungs getting bigger. 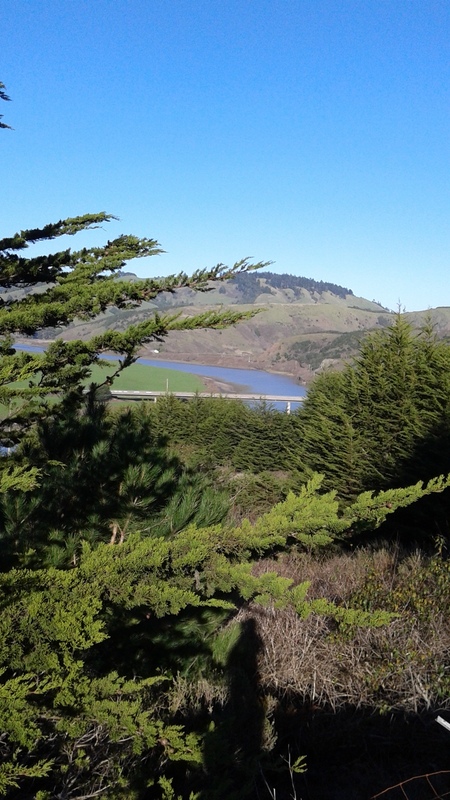 I loved studying the scenery and was just agape at beautiful Marin County. What an extraordinary place… coming from rough-n-tough south side Chicago, it was quite a change of scenery, just the boost I needed. As the days crept closer to the day of the brevet, though, my anxiety grew. I wrote Gabe an email asking if I should really do this. He was very reassuring and advised, “Just bring enough on bike food and go at your own pace.” That was exactly what I needed to hear, since I was worried about being too slow, though I had worked out that at my current pace, I would be able to comfortably make the times required for each control. Then the afternoon before the brevet, upon seeing the weather forecast for rain, I decided I needed mudflaps. Oh man, I looked at sixteen different websites, trying to decide what to do and finally went into Box Dog about ten minutes before closing time. Gabe was there, and he showed me all the different ones they had, and I realized that I had a bunch of sole leather at home that I could cut into mudflap shapes, and just make my own. I mentioned this to Gabe and he gave me a set of bolts to bolt them onto my fenders, suggesting I just buy him a beer at the Marshall store (still owe that beer). This was not without some hesitation on his part coupled with the warning that people often do projects like this the night before a brevet and it ends up making them late or lose critical sleep. Well, I did end up being a few minutes late, just a few. I wanted to start at the back of the group anyway so I wouldn’t feel pressured to go fast. It did rain while I was going through Samuel P. Taylor Park, and of course I could not find a single person to ride behind who had mudflaps. I was totally shocked that several riders did not even have clip-on fenders on their road bikes! I guess I expected that everyone would have bikes exactly like mine, kind of funny now that I have ridden with people on so many types of bikes. While I rode through Point Reyes National Seashore, which happened to be enjoying its 50th year as a federally protected seashore, apparently I was fascinated by the cows. I took more pictures of cows than anything else on that ride. Maybe they reminded me of my time spent growing up in Wisconsin? Most riders talk with resentment or dread about the dairy farms in Point Reyes, because the cattle grates are brutal on bike tires and rims. more cows. Thanks, ladies, for coming out to cheer us on!! Not quite like the crowds on the sides of roads in the Tour de France… maybe the California Randonneur version. Well, I finally made it to the Lighthouse control, and hung out there for just a few minutes before heading back toward the Marshall control. It’s true that the ride to the Lighthouse and back is hard, but it is exhilarating. It’s impossible to explain the sense of accomplishment coupled with the beauty of the landscape. While I was at the control, I even saw a rainbow to the north. Rainbow is faint, just emerging from the edge of the coastline above the rider– anyone care to identify? The ride to Marshall was very difficult for me; it was the only part of the course I had never ridden, and I was starting to feel pretty hungry, ready for that chowder! Sitting inside the Marshall Store and eating my chowder, though, I started to warm up and feel much better. I sat at a table with a bunch of other guys on the ride, some of whom were changing to their dry socks. I left the control with Ron Lau, riding his Pelican! Ron is an incredibly kind-hearted and generous person, and I was very happy to ride with him. At this point, the whole brevet just seemed like a movable party. Of course, I was bringing up the rear of said party, and most of the riders had long finished by the time I made it back to Fairfax. But even though it had been a long day, longer for those of us at the end of the group, the sense of excitement, satisfaction and good will was enormous. So enormous, in fact, that somehow at the finish, Jason Pierce convinced me to sign up for the next brevet whaaaa? Wait, I thought I was finished! I met my goal already! Then I somehow slipped and told Aaron Wong that since it was my first year, I would only ride the 200k-length brevets, which he answered by saying, “Oh, so you’re doing an R-12?” I remember just staring at him with a deer-in-the-headlights, you-just-spoke-my-destiny kind of look for only a fleeting moment, then went back to digging around in the pile of salty chips and cup o’ noodles.